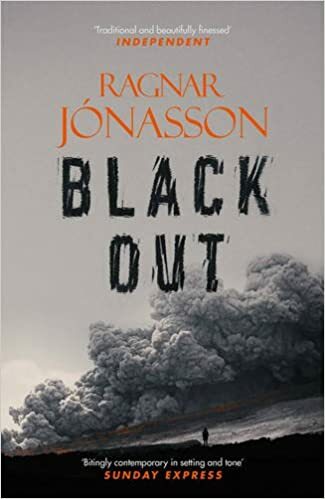 I’m really delighted to be involved in the blogtour for Black Out by Ragnar Jonasson, particularly as I was lucky enough to meet the man himself at the Edinburgh Book Festival on Sunday evening. He was appearing with author JM Gulvin and the first thing both authors spoke about was their setting. If you have read any of the Dark Iceland books – and if you haven’t, why not? – you will know that Siglufjordur is almost as much a character in the book as the young policeman protagonist Ari Thor. Ragnar Jonasson explained that it is a real place and the most northern town in Iceland. His father grew up there and he has been visiting his grandparents since he was about three, so it’s a place he’s very familiar with. It is a very isolated town with access via a mountain tunnel and it is surrounded by mountains which for two months of the year, effectively block out any sunlight. It is a dark and cold place in winter when it gets lots of snow, even avalanches, making it even more closed off. On the other hand, in summer it is hardly ever dark. Ari Thor is investigating the brutal murder of one of the town’s residents but is not helped by one of his colleagues Hylner who seems very pre-ocupied. Hylner fears that a dark childhood secret, one he is very ashamed of, is about to catch up with him. A young reporter from Rekyavik has come north to carry out her own investigation, hoping for a story which will save her career. But she too has something she is trying to put behind her and has a personal connection to the case. As the investigation unfolds, it seems that many of the residents of the town, including the murder victim, have something to hide. And something the victim had very literally hidden made this book for me the most gripping of the Dark Iceland novels so far. One of Ragnar Jonasson’s skills is leaving you hanging at the end of a chapter wanting to know more. There were several times when I though ‘no – I have to know what happens next!’. He has created a really eerie atmosphere in the secretive community. As well as the town being geographically isolated, many of the townspeople have effectively isolated themselves, keeping their secrets close. Ari Thor too is rather isolated finding it difficult to form relationships whether of a romantic nature or just personal relationships with his colleagues and the townspeople. Black Out had many strands to the story and because of this I found it a very fast paced read, almost a race against time for some of the characters. There are plenty shocks and revelations, not least something most unexpected which happens to Ari Thor! It’s full of suspense and the claustrophobic atmosphere created by the volcanic eruption makes for a dark, thriller of a read. To return to the book festival event, Ragnar Jonasson read a passage from Night Blind which was actually his grandfather’s writing. His grandfather wrote books on the history of Siglufjordur when he was in his 70s and 80s. This particular passage was one of the author’s favourites and describes how the sun disappears behind the mountains for winter and the effect this has on those living in the town. It has never been available in English before and was a moving tribute. Ragnar Jonasson said he feels in some way that he is carrying on his grandfather’s work by writing about the town. As is usual at these events, there was time for questions from the audience and I asked why he hadn’t translated his own books into English, as I know he has translated many Agatha Christie books into Icelandic. He said that he feels it is always best to translate into your native tongue, although he has translated some of his short stores into English. He said the best translations are always done by a native speaker of the language the work is being translated into. Oh you must read them, they’re great! Sounds great. I also have to confess to never having read any of his books yet. Another one to add to the to be read pile but that’s OK, it might go to the top from this review! You should read Snow Blind first if you can, as that’s the first in the series. This is second – although third published. They can be read as stand alone but as with all series, some storylines carry through particularly with the characters’ personal lives. Sounds great Joanne, thanks. Will check out Snow Blind online now and let you know how I get on with it.